Sunless spray tanning machine manufacturing suppliers to the solarium salon business of the worldwide market, Italian sunless tan booth manufacturer for wellness beauty care distributors using biologic self tanner made in Italy. 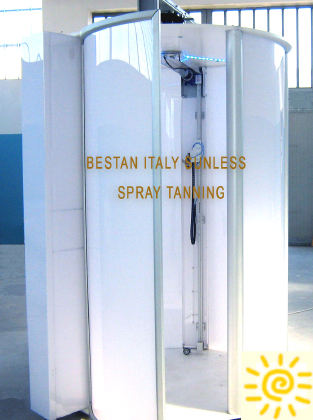 AUTOMATIC SUNLESS SPRAY TANNING Our automatic spray tan booth, 100% Made in Italy, was designed to give you the same colour and skin care benefits as natural sun plus comfort, privacy and convenience. BESTAN AUTOMATIC SPRAY TAN the Italian automatic skin treatment spa, that combines healthy skin therapies with high technology including new lighting therapy to feel Relaxed, Comfortable, and Dry during and after your BesTan experience. THE BESTAN SYSTEM is the newest Italian generation of automated full-body tan treatment that allows you receive a combination of solutions that will bronze and smooth your skin. With preheat design utilized offers a perfect skin care treatment solution and comfort to fortify, moisturize and rejuvenate. You will feel totally pampered in the ultra comfortable sessions. LIGHT THERAPY TECHNOLOGY MADE IN ITALY new automatic and variable lighting solution designed to give you better performane to enjoy your tanning treatment and love the look and health of your skin afterwards. TANNING RELAX, REVITALIZE, REJUVENATE comfortable and easy tanning process, in a controlled atmosphere, to VIP Spray Tanning Salon at the best price of the market. NATURAL TANNING COSMETIC The cosmetic applied cover uniformly on the skin is 100% natural and safe, it has been tested in scientific laboratories and doesn't presents risks to the health, can be used with any type of skin, does not cause skin aging, rashes, burns and melanoma... it's 100 UV FREE. BESTAN LED LIGHT THERAPY BesTan Italy offers a light therapy during your Tanning Session, using our polychromatic light emitting by colour diodes gives very bright full-spectrum light to your skin improving comfort and health. 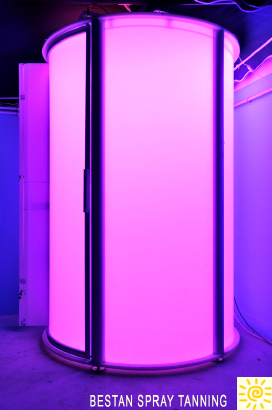 The light changes automatically during the treatment. Normally the light therapy is associated with the treatment of skin disorders, sleep and some psychiatric disorders. Light therapy directed at the skin is also used to treat acne vulgaris, eczema and neonatal jaundice. Light therapy which strikes the retina of the eyes is used to treat circadian rhythm disorders such as delayed sleep phase syndrome and can also be used to treat seasonal affective disorder, with some support for its use also with non-seasonal psychiatric disorders.